The Milwaukee Brewers’ retooling happened quicker than expected, but the team still has a number of promising prospects. Every Thursday for the rest of the season, FOX Sports Wisconsin will take a closer look at some specific young players in Milwaukee’s farm system — as well as noting others who might be stepping up — measuring, highlighting and evaluating their progress. 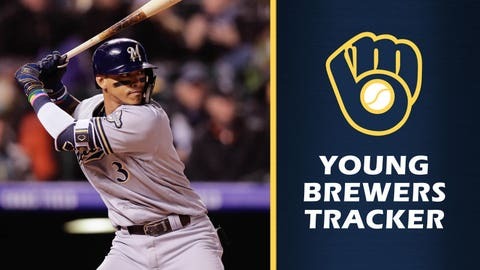 This is the 10th edition of the 2018 Young Brewers Tracker. Season: 18 games (13 starts), 3-4, 5.21 ERA, 77.2 IP, 83 H, 7 HR, 31 BB, 81 K, .278 OBA, 1.47 WHIP. Notable: Burnes rebounded after a rough week but has still allowed seven runs on 12 hits in 8 2/3 innings as a reliever. Last week: 6 games, 21 AB, 7 H, 3 2B, 1 R, 0 RBI, 0 SB, 1 BB, 4 K, .333 BA. Season: 77 games, 297 AB, .249 BA, .306 OBP, .367 SLG, .673 OPS, 15 2B, 1 3B, 6 HR, 32 R, 32 RBI, 1 SB, 23 BB, 52 K.
Notable: After a rough May in which he batted .190 and left his batting average as low as .206 on May 24, Erceg hit .276/.324/.429 in June and has started off July going 4 for 10 with a pair of two-hit games. Last week: 2 games, 7 AB, 0 H, 0 R, 0 RBI, 0 SB, 1 BB, 0 K, .000 BA. Season (Double-A): 24 games, 92 AB, .326 BA, .380 OBP, .511 SLG, .891 OPS, 11 2B, 0 3B, 2 HR, 16 R, 4 RBI, 6 SB, 5 BB, 18 K.
Season (High-A): 50 games, 206 AB, .320 BA, .382 OBP, .529 SLG, .911 OPS, 16 2B, 3 3B, 7 HR, 38 R, 23 RBI, 4 SB, 14 BB, 47 K.
Notable: Hiura hasn’t played since June 29 due to an injured thumb. Last week: 5 games, 20 AB, 5 H, 2 HR, 3 R, 8 RBI, 0 SB, 2 BB, 5 K, .250 BA. Season: 44 games, 163 AB, .301 BA, .363 OBP, .552 SLG, .915 OPS, 10 2B, 2 3B, 9 HR, 31 R, 35 RBI, 2 SB, 12 BB, 54 K.
Notable: It was another productive week for Nottingham, who has four home runs and 15 RBI in the past two weeks. In June, he hit .264/.312/.458 with three homers and 15 RBI. Season: 11 games (6 starts), 1-3, 2 SV, 4.20 ERA, 45 IP, 44 H, 6 HR, 16 BB, 47 K, .249 OBA, 1.33 WHIP. Notable: Ortiz was used in a relief in a game started by Wade Miley on June 28. He threw 51 pitches before being replaced. Ortiz has pitched more than four innings just three times this season — in his first three appearances. He had a 5.21 ERA in June, but .244 OBA and 1.37 WHIP. Last week: 6 games, 26 AB, 5 H, 1 2B, 1 3B, 3 R, 3 RBI, 0 SB, 3 BB, 7 K, .192 BA. Season: 64 games, 229 AB, .245 BA, .337 OBP, .402 SLG, .739 OPS, 10 2B, 7 3B, 4 HR, 35 R, 21 RBI, 10 SB, 33 BB, 83 K.
Notable: After going hitless in his first two games in July, Phillips went 2 for 4 on July 4 vs. New Orleans. In June, Philips slashed .237/.298/.419 with four triples and four steals. Last week: 6 games, 21 AB, 5 H, 1 2B, 3 HR, 4 R, 8 RBI, 2 SB, 2 BB, 5 K, .238 BA. Season: 79 games, 313 AB, .246 BA, .341 OBP, .460 SLG, .801 OPS, 21 2B, 5 3B, 12 HR, 47 R, 39 RBI, 20 SB, 41 BB, 97 K.
Notable: Ray slumped a bit in June, batting .223/.324/.404, hitting three home runs and stealing seven bases. Others: SS Orlando Arcia hit a home run in his first game back at Colorado Springs on July 4. It was his first home run since April 19 when he was with the Brewers and his first extra-base hit since May 18. It was Arcia’s first game played in Colorado Springs since Aug. 1, 2016. The home run came in the first at-bat for Arcia, who hit second in the lineup. … Sky Sox OF Tyrone Taylor (2nd round, 2012) slugged four home runs last week and now has 12 on the season, which is tied for the team high. Taylor had nine hits (.333) last week. … Colorado Springs OF Domingo Santana was 7 for 23 (.304) last week but with just one extra-base hit, a double. … UT Nate Orf, now with the Brewers, and C Christian Bethancourt were named to the Triple-A All-Star Game. … Carolina RHP Victor Diaz allowed three runs on nine hits in 13 innings while walking just one and striking out 11 over two starts. … Wisconsin C KJ Harrison (3rd round, 2017) broke out of a season-long slump, batting .409/.458/.773 last week with two homers and eight RBI. … Timber Rattlers OF Zach Clark (19th round, 2016) slashed .368/.455/.737. … Helena LHP Wilfred Salaman tossed 12 scoreless innings over two starts, allowing just six hits while fanning nine. … In his first week of pro ball, Helena 3B Eddie Silva was 7 for 17 (.412) with three doubles. … Helena C David Fry (7th round, 2018) hit .360 last week and in his first 14 games is slashing .311/.415/.533 with two homers. … OF Carlos Rodriguez of the DSL Brewers was 9 for 15 (.600) and in 21 games is batting .452 with a .559 slugging percentage.